Runaways creates a feeling of conflict in me at this point. Having been severely disappointed with Terry Moore’s first story arc, both in terms of script and also the art by Humberto Ramos (who only did the cover of this issue, much to my relief). But by reading beyond this point, I am perpetuating something which is a problem with comic books. By buying mediocre books consistently, consumers are displaying positive sales to books which are not that good and as such, are encouraging bad books. But after Terry Moore’s run, who I was originally very excited to read because of my love of his original work “Strangers in Paradise,” the creative team will switch to Christopher Yost, a writer I quite enjoy. So I am forced to read these issues as set-up to the next run. Thankfully, however, Moore has made this issue fairly entertaining, having found the voices of the characters. Unfortunately, the actual plot is dismal as the last. Here in lies the problem, the first few pages of this Runaways issue are fantastic and they aren’t doing anything. The depth of these characters made by original creators Brian K. Vaughan and Adrian Alphona has made it so this cast could literally stand around a table for the entire issue and it would be very enjoyable. But they need a purpose (apparently), or at least something to hit and so the Runaways enjoying some downtime are whisked away to another adventure. Those first five pages were amazing though, involving Victor, Klara, and Molly playing Wii and finding wonderful ways to get the upper hand; also Karolina and Nico share a quieter moment on the beach. While one scene is just plain fun, Moore displays a handle on the characters in the latter, and also proves he can make a fairly mundane situation full of good material. 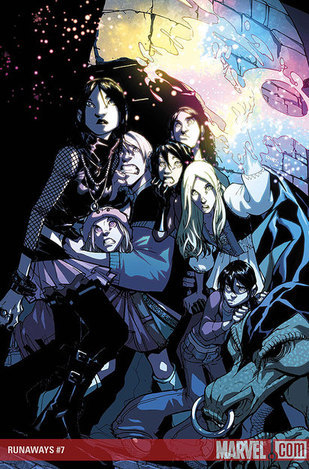 Even the fight sequence between the Runaways and some very aggressive rock band is semi-enjoyable. Moore has some fun with language, Klara saying “a sound garden,” and Nico referring to “Respect.” But it’s the rest of the issue which is terrible. Basically a radio deejay has decided to raise up an army of zombies but he needs a single unifying characteristic for all the people to be zombies. So what do tons of people in Los Angeles have in common physically? The answer: plastic surgery. And so we get a story about plastic surgery zombies taking over Los Angeles. I am not a fan of the overarching story because it seems very, very stupid and I no longer have the faith that Moore can pull the story out of the water. But if he keeps on with his good work with the characters, then maybe there is still something very salvageable in this run. If not, the tea switches at issue ten anyway. As for the art, I’m just glad Humberto Ramos is gone, I did not enjoy his overly cartoonish and very exaggerated style which I felt conflicted with much of what Runaways is as a series. But he is gone and Runaways welcomes back Canadian Japanese artist Takeshi Miyazawa. Miyazawa has drawn four Runaways issues previous to this and I gladly welcome him back. I do not read a lot of manga and as such am not very familiar witht the style, but his art is much more grounded than Ramos’. His characters are expressive, his action sequences fluid and fun, and overall it is very solid work. There is little to complain about, he does the job and he does it very well. I no longer feel myself fighting with the art to interpret the comic, but rather Miyazawa is helping Moore’s script. 6.5/10 The big story is very bad, but Moore has found his feet with the characters. Also, a serious upgrade on the quality of the art.